A girl, her fiddle, and a quest to save her family at what might be the end of the world in 2041—what more could one ask for in a book? Well, what about love? 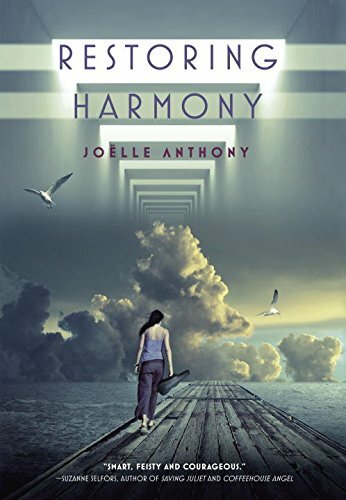 In Joelle Anthony’s new dystopian work, Restoring Harmony, she’s got that, too. Sixteen-year-old Molly McClure has been safe and secure for most of her life on a remote farming island in Canada. She has never been hungry despite the destruction of many of the world’s biggest cities and the widespread flood of disease, looting, and famine. Everything in her life has been calm and orderly including her musical training on her beloved fiddle, Jewels. She lives a quiet life with her parents and siblings, a life almost out of the past. Unfortunately, when contact ceases between her grandparents and her family, it falls on Molly to travel illegally outside of the country to search for them in the now-devastated United States. It is a United States after the Collapse, one ruled by crime and The Organization that comports itself much like familiar organized mobsters of the past. Around every corner is danger and devastation. One wrong step could be Molly’s last. Finally finding her grandparents starving in Portland and without the means to return to Canada, the feisty teen must do the impossible to survive and lead her family back together again. As she searches for the answers to the questions she seeks, she begins to trust her new acquaintance, Spill, who seems to be able to make anything happen. But is he simply too good to be true? Even more importantly: Can he help Molly do the impossible or will she have to make the ultimate sacrifice in order to get her family back together safely? An interesting dystopian novel focusing on familial relationships and a teenager with a heart of gold, Restoring Harmony is very different from what you might expect when you hear the word “dystopian;” but as it turns out, this reviewer thinks that’s a good thing. Exploring the emotions of family, an individual’s connection to a passion such as music, and an overarching love of life is simply not done enough in this genre. Restoring Harmony intertwines them all—along with a nice dose of the future, advanced technology, and dangerous adventure.